Rinema has launched its social movie site for cataloguing the movies you’ve seen and finding people with similar taste as you. 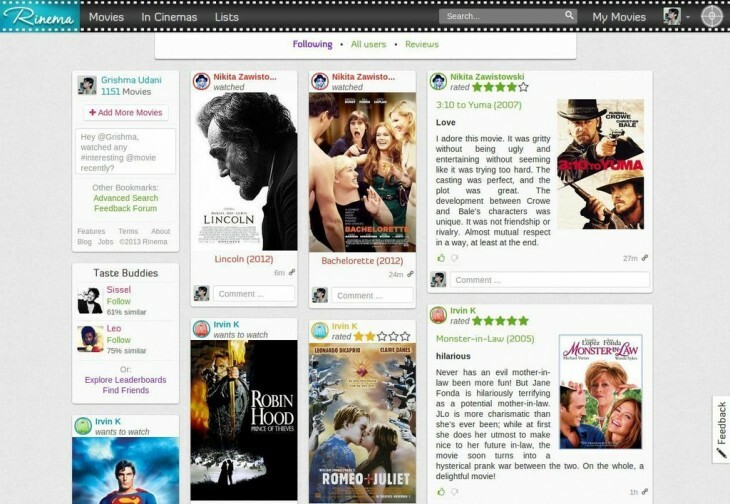 Movie and TV-focused social networking services like GetGlue and Seenth.at have been cropping up at a regular pace, but Rinema’s strengths lie in its sizable database (170,000 movies) and an international focus. Founder Grishma Udani set out to build the service as a “Goodreads for movies” after being unable to find a service that fit her needs. New users are advised to start by quickly rating 20 movies on the site. Once you’ve done so, Rinema will rate other users by how similar their preferences are to yours. You can then follow these “Taste Buddies” to find recommendations for movies you might like. If you’d prefer to connect with your own friends, you can lean on the Facebook integration, but there’s not much of a guarantee that you’ll like the same movies as your Facebook friends. Read next: 10 Mac apps in 1 bundle, name your own price. Come and get 'em!